Let’s continue with my theme of freshman efforts from Adam Wreck #1. 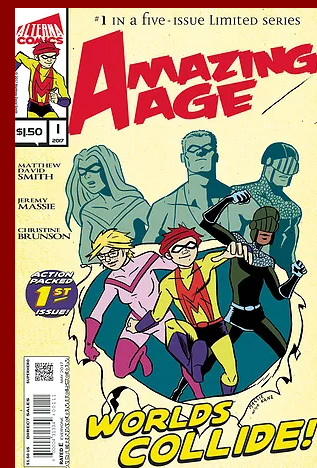 Amazing Age #1 was much better than a freshman effort. Alright, so stay with me. The first of couple of pages taken at face value were not surprising. The dialogue was very fluid and very clever, believable, the plot predictable. The art was flat and sometimes unclear, but wait. Remember in my Adam Wreck #1 review when I said there were no twists or surprises? 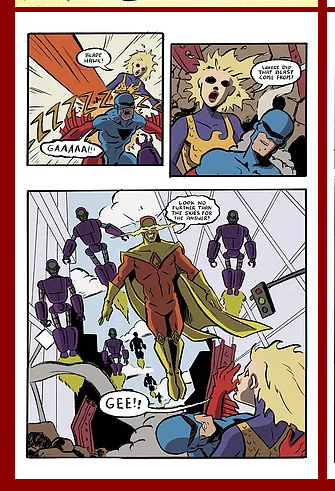 There were plenty of twists and surprises in Amazing Age #1. Not just normal, predictable surprises, but wonderfully delicious surprises. No really. Hop on. The nice thing about the story-telling is it was fast-paced, but succinct. It gave you just enough information, kind based on stereo-types, and trusted you to get it. It covers a lot of ground in one issue, but clearly. You can tell the Matt David Smith has a soft spot for his characters. And once I realized what the book “was’, Jeremy Masse’s art felt like a very natural fit. For me, there was one twist to many, but I get it, and it wasn’t enough to throw me off the book. At the very least it is worth checking out issue #1, but Mr. Smith has laid out enough bait that I think you’re going to follow the story to the end.